The B2 sheet-fed digital press that produces the widest commercial application range1 with breakthrough print quality, high productivity, and wide versatility. Explore what the HP Indigo 12000 can do for your business. Significantly increase your productivity with a robust digital 29-inch press for any commercial application on almost any substrate. Boost efficiency and uptime, with sophisticated automation tools. Enjoy unlimited versatility to print on the widest range of substrates and deliver new commercial applications. Expand your capabilities to specialty substrates, with One Shot Color Technology. Set a new quality benchmark, surpassing offset, with the HD writing head.3 Double print resolution and get higher smoothness on photo and high-end jobs, and create high-detail, gallery-quality prints. Innovative pallet feeder allows varied B2/29-inch media types in one pile. Laser-guided pile adjust simplifies loading. Multi-pick prevention system stops jams. 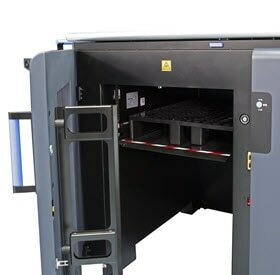 Dual media drawers enable multi-substrate jobs and media feeding while printing. The tray rises, for easy access. Drawers are monitored via the press UI. The new high definition (HD) imaging system reduces ink dot size by 30%,⁴ beating offset quality. 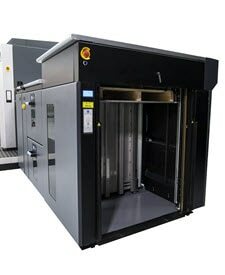 Print up to 4600 sheets/hr, auto-duplex, up to 7 colors. 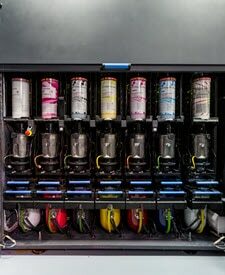 This ink ecosystem doubles ink flow and reduces replacements. It has up to 7 color stations, a “double” ink station for two ink cartridges, and a mixer. The stacker fits 85 cm (33.4 in) of media. It offers outset stacking and multiple output destinations and can be connected to inline finishing systems. Use HP PrintOS, a secured cloud platform connected to your HP Indigo 12000 Digital Press and enjoy absolute control over your print operations anytime, anywhere and on the go. Leverage HP PrintOS’s powerful tools to meet your growing and changing needs, for new efficiencies, capabilities, and growth opportunities. 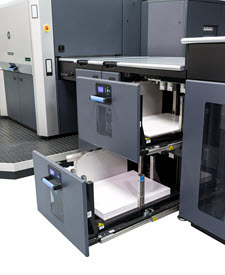 1 Compared to major digital printing competitors. 2 The HD imaging system is offered in the value pack upgrade. 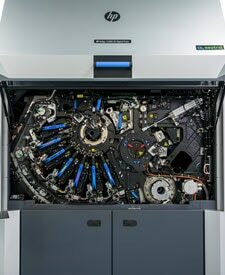 3 The new HP Indigo HD Imaging system is offered as an option, both as a new HP Indigo 12000 HD Digital Press and as a field upgrade option for existing HP Indigo 1x000 series presses. 4 Compared to the HP Indigo 12000 Digital Press without the optional HP Indigo HD Imaging system.